The good news is that we are on the overnight train from Warsaw to Moscow. The bad news is that we seem to have lost our ticket and risk being thrown off at the next backwater village. The odd thing is that we had the ticket when the conductor came by and have not left our compartment. I am assuming he must have taken it. We will see what happens. In the meantime it is about 90 degrees in our tiny two-bunk compartment, and there is no café car. And we are creeping along as if we were in the US. No bullet train today. Welcome to Eastern Europe! Actually getting on the train was half the fun. After some effort to determine which platform the train would be on, we went to platform 2 where a herd of anxious people were waiting; and one friendly English-speaking guy wearing a blue, plaid shirt confirmed that this was the Moscova platform. (He too was headed to Moscow.) Then all of a sudden –at the approximate time the train was supposed to arrive–after an incomprehensible announcement, everyone on the platform started running madly toward the escalator including the guy with the blue plaid shirt. We madly rushed behind him and the mob, which appeared headed for platform 1, where a train was waiting, conductors looking at their watches impatiently, and people desperately running for the doors. We were dead last (since our car was at the rear of the train and we had longer to go and more luggage to pull), and the conductor hurried us up and helped us pull up our 50 pound suitcases as the train started to move. Whew! We are on our way to Moscow where we will arrive in about 20 hours if we make it through Belarus border control and don’t get thrown off for losing our ticket. But what about about Warsaw? In a word, it was terrific. Warsaw is definitely a sleeper. Embry was here on a choir tour in 1988 (along with her mother, who joined her since the Charlotte Symphony was accompanying the Cathedral Choral Society in a performance of Beethoven’s 9th Symphony). In those days it was grim: dull grey buildings, no advertising of any sort, empty restaurants, all owned by the state, offering lousy food with poor service, no evidence that anything new had been built for a long time, limited food options in the stores, and an atmosphere of gloom. In short it was a poster child for the Soviet Occupation. Ironically, it was only a year later—in 1989—that the Soviet Union collapsed; and shortly after that Poland gained its independence. No one Embry talked to in 1988 had a clue that this was coming. So what is Warsaw like today? It is a complete sea change from what is was 25 years ago. It is certainly not a Madrid, Paris or Berlin, but it is a thriving city with energy and vitality and optimism and hope for the future. There are perhaps a dozen new tall glass office buildings with 30 or more stories, a number of elegant hotels, most of the major hotel chains, shopping malls and street fronts with all the major retail chains, countless restaurants offering a wide range of food, bright lights and a lot of restoration still in progress. Most impressive is the restoration of the “Old Town,” rebuilt from drawings and other documents, since most of it was destroyed in World War II along with the rest of Warsaw. A lot of money has gone into rebuilding and restoring Warsaw. The Old Town now feels very much like the older sections of Madrid or Valencia. There are numerous outdoor cafes and small shops and several large plazas. And the restoration actually covers a fairly large area, similar to Georgetown or Capitol Hill. It was jammed packed, full of people both days we visited. What made our first visit to Old Town special was that the day–May 3, our first full day in the city–was Constitution Day, celebrating the fact that Poland has the oldest constitution in Europe (and which is older than the US Constitution). 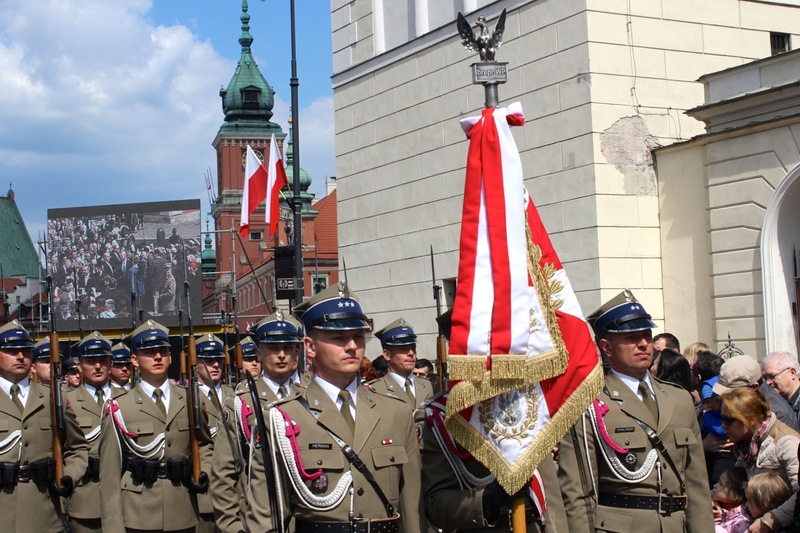 The main street of Old Town was decorated with red and white Polish flags, and thousands of people lined the streets on this beautiful, sunny day to hear speeches and watch the dignitaries parade up the long avenue accompanied by bands and marching soldiers. We stumbled upon this spectacle and enjoyed every minute (though unfortunately John stayed back at the hotel nursing a pulled muscle). There is terrific pride here as evidenced by people waiving miniature Polish flags, wearing small red and white buttons and ribbons and the exuberant spirit of the crowd. And they have good reason to be proud. Warsaw was obliterated by the Nazis and did not fare much better under the long Soviet occupation. But these two occupations were only the most recent in a long chain of conquests going back to the Middle Ages—Prussia and Russia being the primary culprits. For many years they were not even considered a country at all. There is something about the Polish soul that does not give up, and which keeps outlasting the foreigners who lay claim to their homeland. A few other observations: in terms of city planning and design, except for the restored Old Town sector, Warsaw seems a lot more like US cities than it does the Western European cities we just visited. John and I took a day trip out of the city and observed that suburban sprawl and junk advertising are pretty much on a par with US cities. The countryside is beautiful with lush fields and small farms and villages; but along the road it is KFC, McDonalds, Burger King and every kind of sign you can imagine, along with our European friend, Graffiti. Then there is the role of the Catholic Church. According to everyone we talked to in Spain, France and Germany, the established church is for most people—especially young people, academics, intellectuals and “thinking people”—a thing of the past. Not so here. You can feel the presence of the church—clergy and nuns walking the sidewalks, clergy represented at Constitution Day, and standing room only at the large Catholic Church where we visited briefly on Sunday. There are probably many explanations, but one is that in Spain, Germany and France, the Church generally took the side of the bad guys, tacitly supporting Franco, the Vichy Government and Hitler. In Poland, they were clearly supportive of and instrumental in the Liberation effort during and following the Soviet occupation. It is refreshing to experience a Church seems to be very vital in people’s lives. Finally, a special thanks to John and Grace Curry for joining us for this part of the trip. They enjoyed doing the same kind of things we did, and we had great fun being with them in Germany and Poland. As we make our way to Moscow, they are now on a plane to Frankfurt where they will spend a day before heading home. We will miss them. Yesterday Embry and Grace took the bullet train to Krakow, and John and I hired a driver to take us to Auschwitz. That is the subject of the an accompanying post. Wow, you guys seem to be losing things. Hope things work out.